Methi seeds or Fenugreek seeds have a special place in the spice rack of every Asian and Indian kitchen . Let us see the benefits of methi seeds in details. Fenugreek in Hindi is called methi, While Fenugreek in kannada is called mentya. It has so many different names, Fenugreek in tamil is called ventayam and Fenugreek in telgu is called mentulu. Benefits of methi seeds are numerous and hence Fenugreek seeds are not only famous for culinary purposes, but they are also very useful as a medicinal herb and as a home remedy for several health issues. These benefits of methi seeds are attributed to its nutritional components. Let us first see these important phytonutrients before reading the magical benefits of methi seeds. Let us now see the benefits of methi seeds in reducing cholesterol, diabetes and in weight loss. The other benefits of methi seeds include helping in skin and hair loss issues, helping the nursing mothers, and treating menopausal symptoms. Fenugreek seeds help in reducing cholesterol. Fenugreek when soaked and consumed, helps in lowering the blood cholesterol levels, specially the LDL cholesterol. The soluble fibre galactomannan in methi seeds attaches itself to the clots, cholesterol and fat cells that adhere to the blood vessels and block the blood passage. It then forms a gel with these substances and helps in de-attaching them from the surface of the walls of blood vessels and eliminating them from the body. Hence fenugreek seeds help in preventing cardiac ailments like atherosclerosis and strokes. How to consume methi seeds to avail this benefit ? Soak methi seeds overnight in little water. Gulp these seeds on empty stomach in the morning. Use methi powder. Mix it with warm water in a glass and drink this every morning on empty stomach. Methi seeds should be soaked overnight and then sprouted to avail maximum fibre from the seeds. The galactomannan fiber swells up upon entering the stomach and leaves you with a feeling of satiety. This suppresses your appetite and helps in controlling quantity of food intake. The fiber in methi seeds helps in weight loss by regularizing the release of blood sugars and helps in preventing sugar spikes in blood; hence you can control your hunger and cravings for eating junk food. Soak methi seeds overnight in little water and leave it for sprouting . Gulp these sprouted seeds on empty stomach in the morning. You can add methi seeds while seasoning your veggies . Fenugreek contains Diogenes, a naturally occurring steroid saponin that facilitates and increases the milk production in nursing mothers. Fenugreek seeds contain good amount of vitamins and minerals which helps in good growth of the feeding infant. You can chew on soaked methi seeds or gulp them down with water. Mix the powder of methi seeds with some fennel seeds and mishri (small crystallized sugar lumps ) and have 1 tsp of t his mix twice a day along with a glass of milk. Fenugreek is considered a good emmenagogue. Emmenagogue is an herb which encourages menstrual bleeding..it is extremely beneficial for those who suffer oligommenorrhea (infrequent or light menses). It is also beneficial to those women who have obstructed blood flow during menses and have severe pelvic or abdominal pain because of this reason. Fenugreek helps in opening up the obstruction and increasing the blood flow during menses. Fenugreek seeds also contain phytoestrogen and isoflavones. Phytoestrogen along with Diogenes help in relieving the menopausal symptoms like hot flushes, mood swings, stomach cramps and depression. Gulp soaked / raw methi seeds with water. Mix methi seeds powder with twice the quantity of carom seeds (ajwain), roast in a little ghee, and mix equal amount of sugar and consume it hot. Fenugreek seeds are beneficial in both types I and type II diabetes. In type I diabetes fenugreek helps by lowering the blood sugar absorption rate. The fiber galactomannan helps in slowing the absorption of sugar from the blood stream and hence keeps the sugar levels at bay. It helps in avoiding unnecessary sugar hikes in the blood. Owing to this benefit, acute episodes of hyperglycemia and hypoglycemia can be avoided. In type II diabetes, Fenugreek seeds help by eliminating the instance of urine sugar. Fenugreek seeds contain 4- hydroxyisoleucine amino acids that may be required for insulin formation. Soak methi seeds overnight in little water. then leave it for sprouting . Gulp these sprouted seeds on empty stomach in the morning. You can add methi seeds while seasoning your veggies, dals and kadhi preparations. 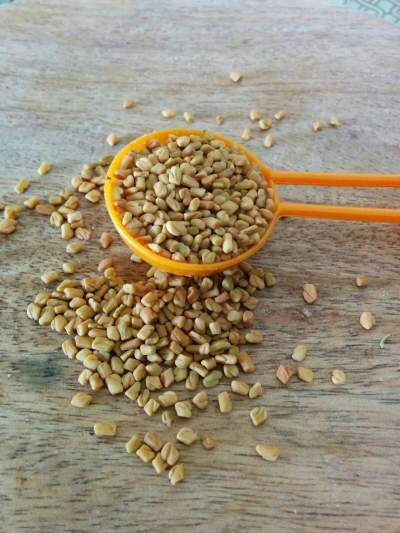 Fenugreek seeds are rich in fiber and help in providing bulk to the stools. Fenugreek seeds help in chronic constipation and painful evacuation problems. It has smooth mucilage which helps in easy excretion of waste. Use methi powder. Mix it with warm water or with milk in a glass and drink this mix every morning on empty stomach. Fenugreek seeds helps in reducing skin inflammation. This ability of methi seeds is owed to its antioxidants. When a smooth paste of fenugreek seed powder with curd is applied on skin, it helps in lightening the skin complexion and also removes the blemishes and scars. Fenugreek seeds help in improving skin by removing the wrinkles, pimples and blackheads and by preventing further breakouts. Grind methi seeds in a course powder. Use these seeds as a scrub to wash your face along with a little gram flour (besan). It helps in exfoliating the dead skins and blackheads from skin surface leaving the skin smooth and glowing. Mix methi seeds powder with curd and apply as a mask. Keep it for 10 minutes and then wash off the face when you feel the stretch. This will help in curing wrinkles and lose skin. Fenugreek seeds should be powdered and mixed with curd. after soaking it for some time , this hair mask should be applied thoroughly on scalp and hair. Fenugreek application on scalp helps in getting rid of dandruff problem. Applying fenugreek hair mask helps in moisturizing the dull dry hair and the hair becomes smooth and shiny. Fenugreek seeds are most helpful when it comes to hair loss troubles. applying the above mentioned fenugreek seed powder and curd hair mask 3 times a month will help in considerably lowering the hair fall and hair loss. Fenugreek also encourages the formation of new hair from the root bud. Mix methi seeds powder in curd and soak it for sometime. Apply this mix as hair mask. Cover the scalp, roots and lengths for over all benefits. Mix methi seed powder with ginger extracts or ginger juice. Apply this mix on scalp to initiate the growth of new hair buds from roots. Methi seeds contains a good combination of photo-chemical and nutrients that goes a long way in preventing colon cancer. Fenugreek contains diosgenin, a steroid saponin; it also contains hemicelluloses, mucilage and pectin. These inhibit the re-absorption of bile salts in the colon.The fiber in fenugreek seeds binds all the components in the colon that may cause harm to the colon lining or those who possess a greater threat and may be carcinogenic. It then helps in excretion and elimination of these wastes. Soak methi seeds overnight in little water and let it sprout . Gulp these sprouted seeds on empty stomach in the morning. The mucilage in fenugreek works best when it comes to coating the inner lining of throat, esophagus and stomach. Thus helps the inner lining against acid attacks and protects it preventing further damage or ulcer formations. Too much of fenugreek seeds are not advised during pregnancy as it has a strong effect on the female reproductive system and may lead to abnormal bleeding or staining. In certain cases gastrointestinal discomfort was reported after large quantity of fenugreek seeds were eaten. Benefits of methi seeds are truly magical when used in the right way. If you have any doubts or queries regarding methi seeds, please leave a comment below and we will get back to you with an answer to it. I am overweight and suffering for arthritis in the knee. Can i take methi water and lemon water concurrently first thing in the morning? yes you can take methi water , but pleASE ADD VERY LITTLE LEMON IF YOU DO . M Mehjabeen, will daily fenugreek seeds consumption increas body heat? take methis seeds and massage yor breasts with till oil . Hi Malavika , what is the purpose ? if you are taking it for diabetes related goal , then please avoid taking these seeds after dinner as it may lad to hypoglycemia at night. How should I take methi seeds for breast enlargement? What should be the quantity? Should I take it in empty stomach or with food in the morning? yes you can take 1 tsp methi seeds soaked in water over night . take this early in the morning on empty stomach . I have 4 month old baby also on Bm n had c section and increase my weight too much can I use methi seeds to reduce weight and how. yesy ou can start having methi seeds, they increase milk production as well help in weight loss. soak 1 tsp methi seed over night , and consume it next moring with a glass o milk . Hi I’m Shilpa ,I have tried roasting fenugreek Seeds and making it into powder ,tried to drink it after mixing in water but I vomited. May I ask if I can swallow the roasted seeds instead of making it into powder and mixing it into water and drinking it. Can I swallow the roasted seeds instead ? What should be the gap between soaked methi and Thyroid medicine and does it interfere with it? Also I don’t want to increase the breast size but want to lose weight should I have it or not? Hi,can I take fenugreek dry seeds with water at night time before bed? sure you can . only avoid if you are a diabetic , as it can cause hypoglycemia in sleep . Is there any contraindication on taking fenugreek while in keto diet for a t2 diabetic adult? he is also taking metformin. no there should not be any side effects of it . just monitor his sugar levels , if they are normal range , then you might want to see your doctor to get your metformin dosage reduced . Paayal ji aapke mobile number??? Many articles also say to drink hot water in the morning empty stomach. So I get confused which one should I drink first. The plain hot water or the methi soaked water. Kindly suggest. Hi Nutan , you can take plain warm water first and then take fenugreek soaked water . what is your age ? if it is 30 + you need not worry . well , if you really wanna avail the benefits , you can take the seeds , but i would suggest you to go natural and take the fenugreek seeds soked overnight in water . Thx for the reply, how many fenugreek seeds should I put in water overnight like 1 tsp or 1Tbsp or ect? Should I boil water first then pour it in a cup along with the seeds or will just cold water due? For the intake of the seeds, do I drink the water along with the seeds or do I drain the water and then swallow the seeds whole or smash them into a paste then swallow that? put 1 tsp seeds in 2- 3 tablespoon water. the water can be room temperature . keep this overnight. next morning swallow the seeds and water and drink more water on top if required . you dont need to chew the seeds. Hi im taking fenugreek powder for breast enlargement. Do i put it in hot water and drink it right away. Do i need to strain it. Hello Payal, how could I use the fenugreek seeds for chronic constipation. Thank you. Hello! How can i use fenugreek seed to gain weight? And what is the correct dosage? fenugreek seeds will help you in clearing your stomach and help in case of constipation , but other than that it does not have much role to play in a weight gain diet. can i take 1 spoon methidana with normal water at bedtime? what are the benefits of it? Hi Rekha , yes you can take but use warm water instead of regular water . all the benefits are mentioned above in the article. it will help you in weight loss, diabetes management , it provides fiber so it can help in clearing bowels regularly every day . it will also improve the glow and shine on your hair and skin . Hi I have heard people telling that if we have the soaked fenugreek seeds in empty stomach will change the colour of skin.Is there any fact in that . scientifically , no truth in this . Hi , I want to decrease my body weight , can I take the soaked fenugreek seeds in the morning with the empty stomach. I have 5 month old baby also i had c section and increase my weight too much can I use methi seeds to reduce weight? But i don’t want to increase my breast size how could i use it? I m feeding too? Please give solution to reduce my weight without increasing my breast size and also without affect my feeding to my baby. Note: daily early morning i m comsuming 1 tsp methi seed and water in empty stomach i feel like enlargement in my breast size so please prefer any solution. Hi sara , see methi seeds alone can never let you to weight loss. its a combination of diet and exercises . so if methi is causing breast enlargement , please stop taking it . read this – https://www.dietburrp.com/how-to-lose-pregnancy-weight/ also we are publishg an article on weight loss for lactating mothers , it has a diet plan too. so please come back kto dietburrp after a day or so and read it . Hlw ma’am I m 22 yrs old and want to increase my breast size …. How much quantity of fenugreek seeds should be used and does it have any side effect ? https://www.dietburrp.com/how-to-increase-breast-size-naturally-at-home/ check this one . How much time does fenugreek took to show it’s effect on body…..? Hi Shivano , a month should give you visible result . Thank you for reading at dietburrp . no sir , take it in soaked form , early in the morning only . soaked seeds do not give you heat . Hii. I want to reduce my weight fastly as i am getting married soon. 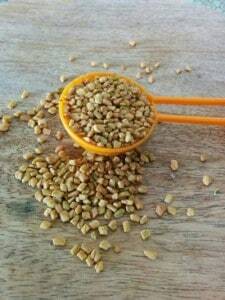 Can i take fenugreek seeds without soaking it in an empty stomach with warm water. soaked seeds will benefit you more . they add up on the fiber and advantages on health. Is it okay to swallow fenugreek seeds with warm water at night to increase the breast size? Yes you can tae it at night or in the morning , both ways is ok . Yes it is believed to be one of the home remedies for spider veins. you can definitely try it . Can i take methi water with triphala pow ampty stomach in morning? i have kid 9 yrs old boy, can i give him soaked seeds daily morning. any side effects? Any specific reason behind this ? if you ar giving him general health purpose , then You can give him after he turns 12 -13 yeasr .. Does the swalloing of dry methi seeds in the night n in morning at empty stomach helps to loose fat ? actually it does not directly reduce your body fat , but ofcourse it add fiber to your routine , and helps in controlling the insulin secretion and glucose uptake , so you can lose weight due to the indirect effects. If you are a non diabetic , it is ok to take it at night . Are you a diabetic ? If yes , then please avoid taking it at bedtime , it may lead to hypoglycemia . I am 50 yrs old lady. I want to reduce my weight. I don’t have any other health problems. But I don’t want to increase my breast size. So how do I incorporate methi seeds in my diet ? Thank you for reading at Dietburrp . You can definitely use it … increasing breast size is possible only in the growth years and a little later , so you do not need to wory about that .. you can soak 1 tsp fenugreek seeds overnight and consume it next morning. I m a 40 yrs old lady and went thru hernia operation last October. I have busy schedule and want to reduce my weight without increasing my breast size. How can i use Methi seeds. Breast size does not increase after a given age . so dont worry , you can soak methi seeds at night and have it next day morning. Is it all right to take methi seeds without soaking it in water overnight.I find it nauseous to eat the soaked seeds while consuming a spoonful with a lass of water first thing in the morning is tolerable . Is it absolutely necessary for health reasons to soak it overnight ? soaking is actually a better way of taking methi seeds , you can soak it , keep the seeds on a strainer for 1 min before gulping it down with water . so all the water is drained . its the water that makes you feel nauseous. Hello can i take methi dana,Ajwain and kali jeeri powder in the morning empty stomach? Hi mam..I have pcos (hormonal imbalance )..Inspite of this i have a little acne prone skin.i wanna regulate my periods..Besides i wanna get glowing skin and hair…i used to drink warm water with honey empty stomach every morning..how can I use methi and fennel seed to get my desired result?? Can i warm the soaked both seed water and have it with honey in empty stomach? ?will this be benefitted or any effect? ?pls let me to know the correct way and guide me to get regular periods,glowing skin and hair.. Thanks for your reply mam..if I start to have fenugreek soaked seed in empty stomach how long should i take?? Considering flax seed since it contains omega 3 fatty acid additionally comparing to fenugreek, which is better..shall I continue with fenugreek or shall I start with flax seed and ignore fenugreek??? flax seeds can be eaten at any time during the day, whereas fenugreek seeds benefit more only when taken on empty stomach. so keep your morning routine as it is , and take flax seeds later during the day. HAI.I AM SUFFERING WITH PCOS.IM CONSUMING METHI POWDER WATER 3 TIMES A DAY BEFORE MEALS.IS THAT OK?